This book won me over completely. I loved it (significantly more than the first book (The Unidentified Redhead). Don’t get me wrong… the first was fantastically fun, and I thought I loved it, but this one… for me, blew it away. And together? They are the perfect book set. A great, easy, and eventually, emotionally involved read. (but if you haven’t read book #1, go read that review first). As funny, cute, quirky and steamy as the first one was, it was also…. hrmmm… well, almost movie perfect. Witty, silly, and sweet. Everything was well timed, and it was fun. Like a wonderful real-life (but so not) fairytale where the famous actor falls for the unidentified girl. Fun to “live” it with her, and to fall in love with them. Almost like the perfect book. The perfect love story. But there wasn’t much conflict. And I like things to get rough (heartache wise) for a bit. It’s what keeps me up all night panicking in a delirious (but ecstatically thrilled) reading mode. And book #1, while great, didn’t have *that* kind of tension (other than keeping the relationship under wraps since Mr. Movie star was supposed to *look like* he was available. A hot commodity if you will). And of course that starts to irk them, but it wasn’t that big of a deal. Until the end *grins* … and then well. My heart wanted me to reach for this book ASAP so I could see how they fared. And boy oh boy my heart went for a ride on a Tilt-a-Whirl!!!! SO FUN!!! Well… not so much for them, but for me as a reader. YES!!! Tear my heart out! Tear it! Please, authors. Do it! Maryse’s Book Blog: Can I just say, I’m 50% into Redhead#2 and I think i’m really mad at Grace right now. Trish: Squeeee…yes what Sali says!!!! Yanira: Ditto! Hang in there. Inhale exhale. Maryse’s Book Blog: Awwww my heart hurts now. I officially like this book most between the two. Me <——— sucker for book pain. Jenny: I know. that book had humour and angst. I love, love those books!!! Maryse’s Book Blog: Book #2 really stole my heart … The tone and mood changes up quite a bit and there are some real relationship issues that come up. I completely related with her worries. Still funny, but toned down into quite a heart wrenching book. “You’re the redhead! Jesus, how old are you?” He snapped a few more pictures as I almost ran inside. 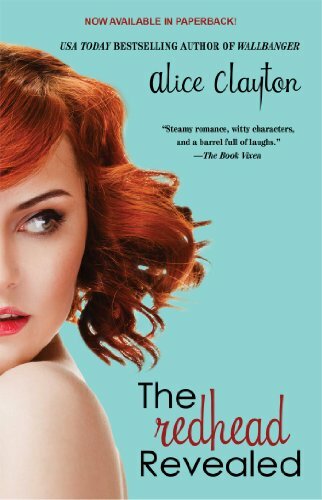 … the relationship gossip, and the disparaging remarks about the unidentified redhead. And those perfect pictures of him out on the town with… ? But something was up with my Brit. He was going out – a lot. Which was fine because frankly, at twenty-four, that’s what you do. Yep. And as they attempt to adapt to a short term – long distance relationship (’cause now she’s part of her own possible up and coming success story), things start shifting in her world. And there’s more to it, but I’ll let you explore all that. Okay and while I admit, I’ve been in worse heartbreaking book situations… serious roller coaster rides, this one was a pleasant and jolting surprise. And actually lent the story a more realistic flavor, a more raw and introspective look at love between an older woman, and a younger man. A famous star, and an up-and-comer. What she felt? I felt. Her reactions? I’d like to say they wouldn’t have been mine, but… Again. Who am I kidding? I absolutely recommend this. This one especially.. But reading the first one is so fun, and makes THIS one that much better. I loved both books as well! Can’t wait for the third installment. I’m almost done with this book..I agree I’m liking it a little more than the first. I like some angst too 😉 It’s kind of like Love Unscripted with a bit of KA heroine-esque humor. I didn’t know there is a 3rd book coming out? Any ideas when? I knew you’d love them!!!!! Thanks for giving the books a try!!!!! This one was just WOW!! I was so happy she took it “there”. Just finished both books..and WOW! I totally loved them! I am telling all my friends about them too! I laughed out loud at times while reading! I just loved the banter between Grace and Jack! This was the perfect, light-hearted, summer read for me. You never steer me wrong Maryse! I love BOTH BOOKS!! I can’t wait for the third one. Are there more books like these? Alice Clayton is definately my new favorite author!!! Thanks so much for recommending this series!!! When is #3 coming out????? I need more George!!!! !